CLEVELAND – Dwane Casey broke what remained of the season up into five-game segments coming out of the All-Star break with the goal of winning each of them. A win at Cleveland on Monday would have made them 3-for-3, something a win at Phoenix on Thursday also will accomplish. But making it 4-for-4 will require their best basketball of the season – and that ugly loss to the Cavaliers makes it a little more imperative that they get it done. The fourth five-game segment will start with a weekend back to back against two of the top four teams in the West, Portland and Golden State, and continues next week to wrap up a four-game road trip at the West’s No. 2 seed, Denver. Those three teams have combined to lose only 25 home games all season for a cumulative winning percentage of .762. The Pistons are 14-5 over their last 19 games and take a 36-34 record to Phoenix with them. The good news is they expect Blake Griffin back after he sat out Monday’s game when the Pistons determined he needed a day off. 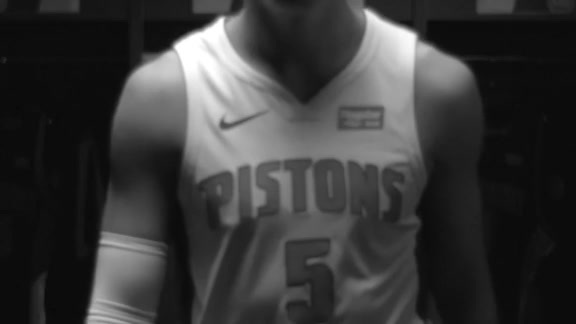 With the Pistons getting two days between games for the last time this season before playing at Phoenix, Griffin will go into that game having had three days of rest coming off of Sunday’s win over Toronto. Monday’s loss to Cleveland could make it tougher for the Pistons to take care of business and still find time for Griffin to take off any more days. While they were losing to the Cavaliers, Miami was opening its own challenging four-game road trip with an upset win at Oklahoma City. The Pistons have a one-game lead over Brooklyn and a two-game lead over the Heat. Those three teams occupy the 6-7-8 spots in the Eastern Conference playoff race with Orlando another 1½ games back of Miami. Even Thursday’s trip opener at Phoenix will test the Pistons. The Suns have won six of their last 12 games with Milwaukee and Golden State among their victims. Monday’s loss at Cleveland should serve to reinforce Casey’s message to the Pistons about the necessity of daily urgency with the season down to its final three weeks. After their road trip ends at Denver next week, the Pistons return home to host Orlando on Thursday and a rematch with Portland on Saturday. To win that fourth five-game segment, they’ll need at least one road win in the final three out west and a sweep of the two home games. And when that turns the schedule over to April and the season’s final six games, the playoff picture should be coming into focus.